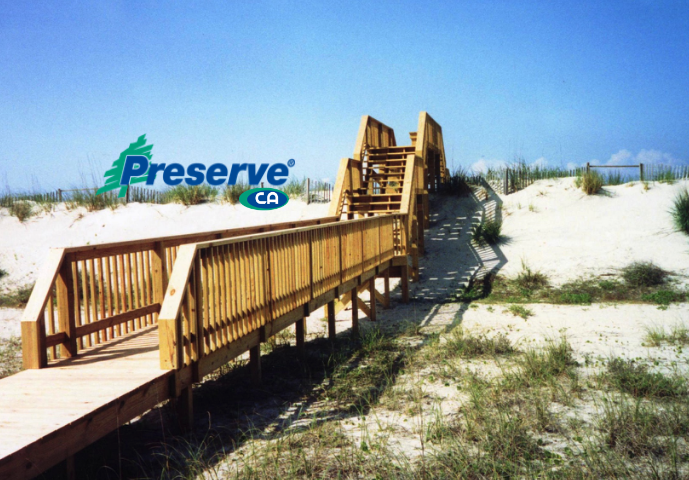 Preserve® is a family of soluble copper-based preservative solutions for exterior wood products that provides long-term protection from fungal decay and termite attack for a wide variety of residential, commercial and agricultural construction applications. In each Preserve® solution, the soluble copper provides most of the protection to the wood, and the co-biocides complete the formulation by adding the protection against the copper-tolerant fungi. Soluble copper is very effective in penetrating the cells in the wood fiber during the pressure-treatment process, providing for optimum long-term protection. The Copper Azole (CA type C) variety of Preserve® used by Sunbelt is a wood preservative formulation made of soluble copper and uses organic triazoles (tebuconazole and propiconazole) as the co-biocide to control copper-tolerant fungi. Products are durable and designed for outdoor construction. An effective and widely used alternative to traditional pressure treated lumber. US Lifetime Residential and Agricultural Limited Warranty against structural damage caused by decay and termites. See the warranty for specific provisions. Building code compliant. ICC – ES Report, ESR-1980. Use corrosion-resistant fasteners. CA preserved wood products are designed for long-term performance in outdoor applications and, therefore, require high quality, corrosion-resistant nails, screws, and hardware. Fasteners (and other metal products) for use with CA preserved wood products include Hot-Dip Galvanized and Stainless Steel. Aluminum should not be used in direct contact with CA treated wood.